Introduction: In these challenging times, practice of dentistry is becoming more complex. Evidence-based dentistry (EBD) strengthen the profession by identifying knowledge gaps, confidence in clinical decision making and encourage to formulate clear questions regarding the evidence needed. It closes the gap between clinical research and real-world practice and provides tools to interpret and apply research findings. Aim: This study aims to describe the knowledge, attitudes, and practices of dentists toward the concept of EBD. Materials and Methods: A cross-sectional survey was conducted among a representative sample of 300 dentists in dental colleges and private practices of Bengaluru city using a self-administered questionnaire. Descriptive statistics was computed. The frequency for each domain of knowledge, attitude, and practice was calculated after giving weight age for each option. For statistical analysis, t-test was used. P < 0.05 was considered statistically significant. Results: Mean age of the dentists was 32.9 ± 8.1 years. Mean knowledge, attitude, and practice were 17.41 ± 6.45, 1.92 ± 0.75, and 17.06 ± 3.05, respectively. Majority of them relied on their own judgment as a guide to primary care practice. Very less number of dentists relied on Cochrane library as a reliable source for evidence-based practice. Conclusions: Although the dentists were generally aware of the concept of EBD very little use of this concept in clinical practice was followed quoting lack of access as a barrier. However, the reflected attitudes toward EBD were good with most of the respondents expressing an interest in having further education in this concept. Evidence-based practice (EBP) is an approach that promotes critical thinking through the integration of patient values, best available evidence and clinical expertise. Today evidence based principles are widely being incorporated in most health-care fields as well as nonhealth professions. Academic institutions, human resources library studies are using evidence-based principles to guide their day-to-day decisions. The goal of EBP is to provide patients with up to date treatment that research has shown to be safe effective and efficient and is to continuously improve patient care based on new research developments and also to provide high quality clinically orientated and relevant research which provides better information for the clinician and improved treatment for the patient. EBP is becoming increasingly common in dentistry. The American Dental Association defined it as “an approach to oral health care that requires the judicious integration of systematic assessments of clinically relevant scientific evidence, relating to the patients oral and medical condition and history, with the dentist's clinical expertise and the patients treatment needs and preferences.”,, In dentistry, EBP can be defined as the practice of dentistry that integrates the best available evidence with clinical experience and patient preferences in making clinical decisions. Evidence-based dentistry (EBD) closes the gap between clinical research and real world practice and provide dentists with powerful tools to interpret and apply research findings. The use of an evidence-based approach can surely help clinicians who want to stay abreast of changes in their areas of health care by assisting them with the selection of relevant articles and will aid them to efficiently extract and apply the information. Computerized medical databases such as Medline, Google scholar have made easier the access to information. Today other strategies are available to help dentist keep abreast with the current information like journals which are available online, web-based continuing education programs. Books audio and videotapes; professional and university continuing education meetings which should give the possibility to interact with the author of new evidence. Although this concept of EBP was born two decades ago its arrival is new in India and is in its developmental stages especially in dentistry. Karnataka state considered the educational hub houses about 46 dental schools out of 315 colleges in India. Bengaluru city has 15 dental colleges offering postgraduation courses, home to the RGUHS one of the prestigious health universities in India, with many dental clinics in private practices and dental faculties employed in dental schools. With so many dental graduates passing out every year from Bengaluru city it becomes necessary for the dentists and dental faculties to be updated in the field. As there are very few studies reported from India with regard to awareness of EBD this study was conducted to assess the knowledge, attitude, and practice and factors affecting it among dentists in Bengaluru city. A cross-sectional study was conducted among dentists in Bengaluru city, Karnataka (India) from February to May 2016. The study was approved by the Institutional Ethics Committee and required permissions were obtained from the Principals/Dean of the college. Informed consent was obtained from the study participants. Where: Z = 1.96, P= 0.5, q = 0.05, δ = 0.05 (margin of error), the sample size was arrived at 400. The development of the questionnaire was based on the items previously reported in similar study. Internal consistency (Cronbach's alpha) for the questionnaire was found to be 0.84. Based on the pilot study, necessary modifications were done in the study pro forma. List of Dental Colleges in Bengaluru was obtained from the Rajiv Gandhi University of Health Sciences website. The dental colleges were selected randomly from the list situated in different zones of Bengaluru city, namely, North, South, East, West, and central. Polyclinics and private clinics in the vicinity of the selected dental colleges were included in the study. A representative sample of 400 dentists working in all these facilities was included with 200 academicians and 200 practitioners. Postgraduate students were excluded from the study. The first section of the pro forma assessed the personal and professional characteristics such as age, gender, field of practice, specialty, and years of experience and job profile. The second section consisted of closed-ended questions to assess the knowledge, attitude, and practice of EBD. Data were collected through personal visits to each of the facilities. Study participants were asked to complete the questionnaire and were collected back immediately. The statistical program SPSS version 18 (IBM Corporation, SPSS Inc., Chicago, IL, USA) was used for data management and analysis. Descriptive statistics was computed. The frequency for each domain of knowledge, attitude, and practice was calculated after giving weightage for each option. Statistical test t-test was used to analyze the difference in the knowledge, attitude, and practice between various factors. A P < 0.05 was considered to be statistically significant. In total, 400 dentists participated in the survey, and only 300 completely filled questionnaires were returned (response rate of 75%). Males constituted 52.5% and 47.5% females. The mean age of the dentists was 32.9 ± 8.1 years with an age range of 23–60 years. Majority of them (47.5%) were in the 31–40 years age group. Of the 300 respondents, 267 (89.3%) had clinical practice, wherein 67.2% had a clinical experience of <15 years. General dentists (BDS) constituted about 30.4% and rest of them were specialists. According to their job profile, only 10.4% were academicians, 40.1% were practitioners and 49.5% were both into academics and clinical practice [Table 1]. Most of the participants chose to rely on their own judgment (92%) followed by referring textbooks (29.4%), dental journals (26.4%), and consulting colleagues (23.1%) to guide their primary care practice and support their clinical decisions [Table 2]. Majority of them reported to “have a vague idea” and “good understanding” of evidence-based tools (statistical terms) such as “P value;” “relative risk,” “meta analyses,” and “odds ratio.” [Table 3]. 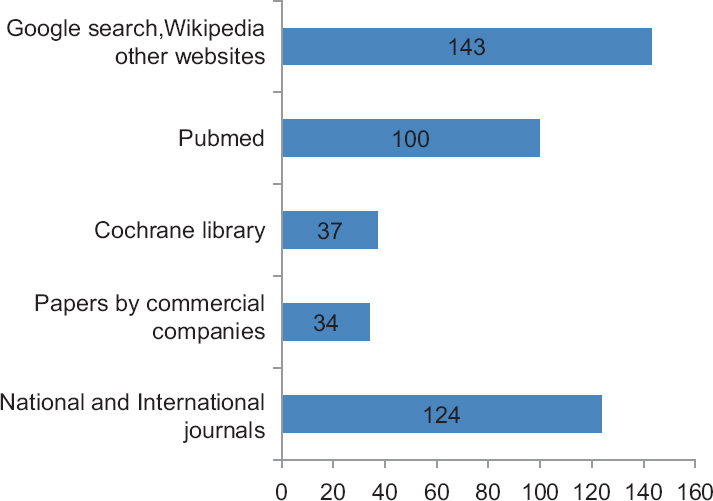 About 47.8% chose “Google search/Wikipedia” followed by “national and international journals” (41.5%) and “PubMed/Medline” (33.4%) as the most common source they accessed for their EBP [Figure 1]. 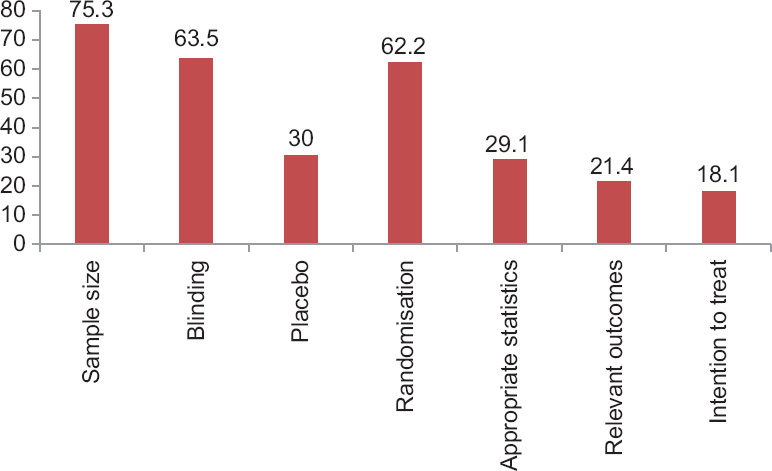 Many of them chose “sample size” (75.3%) followed by “blinding” (63.5%) and “randomization” (62.2%) as most important for a randomized controlled trial [Figure 2]. Most of the dentists (76%) thought that EBD is based on expert opinions and agreed that the practice of EBD helps in making accurate diagnosis and treatment plans for the patient. With respect to the facilities available at the workplace majority of them (79.9%) had their personal computer with an internet connection and also access to international medical journals but most of them had not undergone any training in critical appraisal. The overall mean score of the respondents for knowledge, attitude, and practice was 17.4 ± 6.45, 1.92 ± 0.75, and 17.06 ± 3.05, respectively. 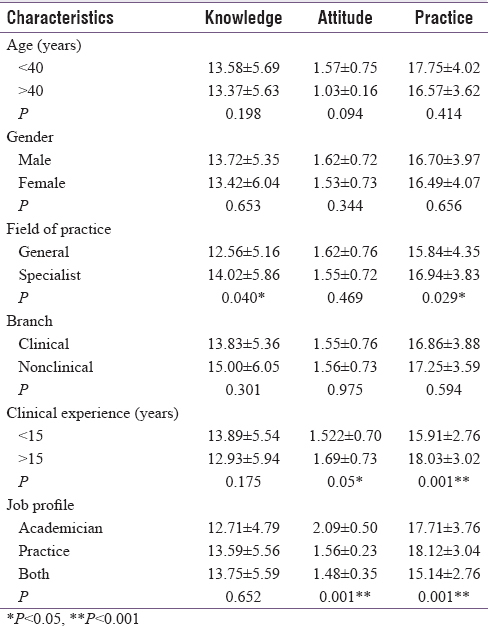 There was a statistically significant difference (P = 0.040) between field of practice, specialist having more knowledge (14.02 ± 5.86) than general dentists (12.56 ± 5.16). Positive attitude was seen with dentists having more clinical experience (1.69 ± 0.73) compare with dentist having less clinical experience (1.52 ± 0.70) and with academician (2.09 ± 0.50); it was statistically significant. EBD was practiced by specialist dentist (P = 0.029), dentist with more clinical experience (P = 0.001), and among practitioners (P = 0.001) [Table 4]. EBP is said to be the current best approach to provide interventions as it improves patients' skills and knowledge as well as the quality of treatment provided to the patients. With research in forefront, there is a need to update the clinical knowledge and improve confidence levels toward its outcomes. Today, evidence-based healthcare is directed at reversing an unsystematic clinical practice that is often based on intuition and pathophysiologic basis and replacing it with one that is evidence based and scientifically proven. This is especially important in today's world of great scientific breakthroughs and achievements. The world is no longer seen as a large unknown expanse but is increasingly referred to as a global village. Information to patients is now available on practically any subject at the touch of a fingertip. However, this information is not always valid and dependable especially when it is acquired via the internet. Learning and practicing EBD will be the key to increasing the proportion of treatments that are evidence based. EBD requires dentists to learn new skills not traditionally taught in dental colleges. There are very few studies reporting the knowledge of EBD among dentists in India, but no studies exist pertaining to dentists in Bengaluru city which houses the majority of dental colleges in India. Academicians were also included as the dentists employed in colleges were also bound to have clinical practice. This ensured that dentists from all backgrounds/fields were included. Dentists both in academics and in practice were more in number in the present study and purely academicians constituted 32% which is more than that reported in the study by Nader et al., (3.9%), this may be due to more number of dental schools in Bengaluru city as compared to any state in India. General dentists group constituted about 30.4% whereas in study by Haron et al., they constituted about 55.8% and in study by Nader et al. (80.7%). Response rate of the present study was 75%, which is less compared to studies conducted by Haron et al., (80%), Gupta et al. (80%), and Nader et al. (100%) but more compared to Yusof et al. (50.3%). In the present study, 40.5% had attended some form of EBD training which is slightly lesser than Haron et al., (58.4%) and a good number of dentists (52.5%), in the present study, mostly practiced EBD which is similar to Haron et al., (54.2%) and in the study by Gupta et al. and Nader et al. 70% of the individuals had heard of EBD. Majority of the dentists in our study had a good understanding of the statistical terms used in EBP and also had a positive attitude to know the terms related to EBD which is in contrast to Haron et al., where the level of knowledge was poor, and 13% felt that knowledge about statistical tools was not relevant. 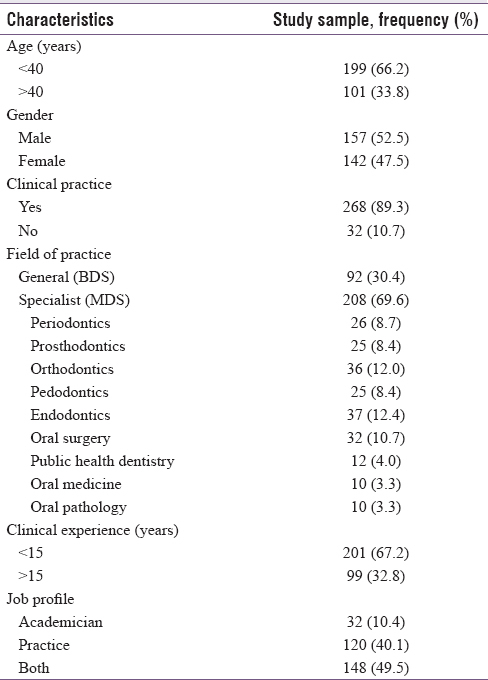 Significant differences were noted with respect to knowledge and practice of EBD when general dentists and specialist practitioner were compared; this difference could be due to the 3 years training course of postgraduation in the specialty where in the specialist is trained to incorporate EBP into clinical practice which is not a part of the undergraduate curricula. Notable differences were seen with respect to attitude and practice of dentists toward EBD when they were compared on the basis of years of clinical experience and job profile. This finding is similar to the results reported by Haron et al., and is in contrast to Yusof et al. and Nader et al. This finding suggests that years of clinical experience must have reinforced the dentist's awareness and skills and also dentists involved in academics have ease of access to resources. Majority of the dentists (90.2%) in the present study relied on their own judgment for clinical decisions concerned with their practice which is very similar to study by Yusof et al. (91.1%) whereas in the study by Nader et al. 77.2% considered consulting a colleague as a way to resolve their clinical problem. When participants were asked questions regarding EBP most of them reported that they had a good understanding of technical terms used in the literature. This could only be their perceived knowledge and may not be their accurate understanding. The study on general dental practitioners in North West England showed that while only 29% defined EBP correctly 49% defined systematic reviews correctly while 68% defined critical appraisal correctly. Regarding attitude, the mean attitude score indicates that the dentists had a general positive attitude toward EBP. This suggests that they believe the use of EBP is necessary and patient care is better when evidence is used. This is in accordance with the study done by Ashri et al. This positive attitude of the dentists is to be looked on as an opportunity for promoting EBP of dentistry. EBP is possible only when there is access to information sources. Most of the respondents reported lack of time, training and access as barriers to practice EBD. In the study by Yusof et al., 22% of them reported lack of necessary skills. Similar results have been reported by Rabe et al., Upton and Upton, from Sweden who reported that the most common barrier toward EBD was lack of time. Other studies have also reported cost-related barriers which were not assessed in the present study. The response rate was less (75%) in this study and also most of the dentists chosen in the study were in the younger age group (<40 years) which might have influenced the outcome. Dentists had a fairly good understanding of EBD though most of them still relied on their own judgment or consulting colleagues for clinical decision-making. Differences were noted with respect to mean scores knowledge attitude and practices when the field of practice, clinical experience and job profile of the individuals. Iqbal A, Glenny AM. General dental practitioners' knowledge of and attitudes towards evidence-based practice. Br Dent J 2002;193:587-91. Sackett DL, Strauss SE, Richardson WS, Rosenberg W, Haynes RB. Evidence-Based Medicine: How to Practice and Teach EBM. 2nd ed. Edinburgh: Churchill Livingstone; 2009. Ballini A, Capodiferro S, Toia M, Cantore S, Favia G, De Frenza G, et al. Evidence-based dentistry: What's new? Int J Med Sci 2007;4:174-8. Bader J, Ismail A; ADA Council on Scientific Affairs; Division of Science; Journal of the American Dental Association. Survey of systematic reviews in dentistry. J Am Dent Assoc 2004;135:464-73. American Dental Association. Evidence Based Dentistry. Glossary of Terms. Available from: http://www.ada.org/prof/resource/ebd/glossary. [Last accessed on 2016 Dec 10]. Hackshaw AK, Paul FA, Davenport ES. Evidence Based Dentistry: An Introduction. Oxford, UK: Wiley Blackwell; 2006. p. 1-9. New Zealand Dental Association. Practice guidelines on evidence based dentistry. N Z Dent J 2003;99:30-2. List of Dental Colleges in India. Available from: http://www.dciindia.org.in. [Last accessed on 2017 Mar 09]. Haron IM, Sabti MY, Omar R. Awareness, knowledge and practice of evidence-based dentistry amongst dentists in Kuwait. Eur J Dent Educ 2012;16:47-52. List of Dental Colleges in Karnataka. Available from: http://www.rguhs.ac.in/institutions_rguhs.html. [Last accessed on 2017 Mar 09]. Adeoye OT. Knowledge and Attitude of Dentists towards Evidence Based Dentistry in Lagos, Nigeria. A Thesis Submitted in Partial Fulfillment of the Requirements for the Degree of MSc in Dental Science, University of the Western Cape; 2008. Available from: http://www.etd.uwc.ac.za/xmlui/handle/11394/2801. [Last accessed on 2016 Dec 10]. McColl A, Smith H, White P, Field J. General practitioner's perceptions of the route to evidence based medicine: A questionnaire survey. Br Med J 1998;316:361-5. Kerse N, Arroll B, Lloyd T, Young J, Ward J. Evidence databases, the Internet, and general practitioners: The New Zealand story. N Z Med J 2001;114:89-91. Coleman P, Nicholl J. Influence of evidence-based guidance on health policy and clinical practice in England. Br Med J 2001;10:229-37. Allison PJ, Bedos C. Canadian dentists' view of the utility and accessibility of dental research. J Dent Educ 2003;67:533-41. Rabe P, Holmen A, Sjogren P. Attitudes, awareness and perceptions on evidence based dentistry and scientific publications among dental professionals in the country of Halland, Sweden: A questionnaire survey. Swed Dent J 2007;31:113-20. Yusof ZY, Han LJ, San PP, Ramli AS. Evidence-based practice among a group of Malaysian dental practitioners. J Dent Educ 2008;72:1333-42. Nader N, Arash S, Sepideh P, Hashemipour MA. Knowledge and use of evidence based dentistry among Iranian dentists. Sultan Qaboos Univ Med J 2014;14:223-30. Gupta M, Bhambal A, Saxena S, Sharva V, Bansal V, Thakur B. Awareness, attitude and barriers towards evidence based dental practice amongst practicing dentists of Bhopal City. J Clin Diagn Res 2015;9:ZC49-54. Irshad A, Ramzan M, Iqbal M. Assessment of knowledge about evidence based medicine in medical students and doctors in a Pakistani health care setting. J Ayub Med Coll Abbottabad 2010;22:126-9. Prabhu S, Joseph J, Sarvanan S. Knowledge, attitude and perceived barriers towards practice of evidence based dentistry among Indian postgraduate dental students. J Dent Med Sci 2012;2:46-51. Fedorowicz Z, Almas K, Keenan JV. Perceptions and attitudes towards the use of evidence-based dentistry (EBD) among final year students and interns at King Saud University, College of Dentistry in Riyadh Saudi Arabia. Braz J Oral Sci 2004;3:470-4. Ashri N, Haifa AA, Hamadah L, Sahr AT, Ashraf EL. Mentally dental and medical practitioners' awareness and attitude toward evidence based practice in Riyadh, Saudi Arabia. A comparative study. Saudi J Dent Res 2014;5:109-16. Upton D, Upton P. Knowledge and use of evidence-based practice by allied health and health science professionals in the United Kingdom. J Allied Health 2006;35:127-33.